New Thanksgiving designs as fresh as the food on Thanksgiving Day! Introducing our new “Happy and Modern Thanksgiving” pieces available in two color schemes- Gold and Gray, and Cobalt. The gold is designed to pop off the page and catch your customers eye. The turkey is familiar, it makes the customer feel comfortable. The color changing leaves signify the fall feeling that we all love so much. 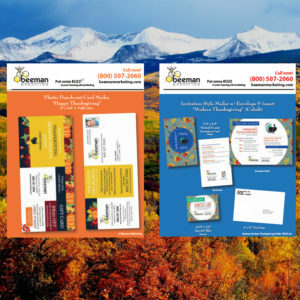 This beautiful design paired with the proven language that Beeman marketing has perfected over the years will bring more phone calls than your hearing aid practice is ready for. Thanksgiving Food and Hearing Health: Thanksgiving is known for food, family, and even more food! Thanksgiving is one of the most anticipated meals of the year for millions of Americans. Stuffing your stomach full of Turkey, stuffing, and mashed potatoes can also benefit your hearing health! Potassium will help regulate blood flow throughout your body which includes helping parts of your inner ear. Aldosterone is a hormone that regulates potassium in the body. As people age there can be a drop in this hormone leading to hearing loss. Good foods rich in potassium are: Sweet Potatoes, Green Bean Casserole, Butternut Squash, and Turkey! Magnesium helps with the functionality of your nervous system, and may also help in reducing tinnitus. Eating right can be a good way to help fight tinnitus, what a better way to start than with thanksgiving?! Whole wheat rolls, and pecan pie are good sources of Magnesium for your Thanksgiving plate. Zinc is heavily used by the inner ear. Adding Zinc to your diet can be a beneficial way to maintain healthy hearing, and help fight/ prevent/ hearing loss. Set out some nuts as an appetizer before your Thanksgiving feast. Nuts like cashews, almonds and pistachios are high in zinc. Enjoy the holiday with friends or family, but you will enjoy the holiday even more if you can pack your practice with appointments!